Edit, enhance, and maintain scanned drawings in a familiar Autodesk AutoCAD environment with the powerful raster-to-vector tools of AutoCAD Raster Design. Convert raster to vector with powerful tools that help you create higher-quality drawings while using standard AutoCAD commands. AutoCAD Raster Design software helps you to: - Save time using image display features that help you embed, insert and export images, and display image subsets with a polygonal mask boundary. - Improve image quality with editing and cleanup tools that help you despeckle, bias, mirror, and touchup scanned design information. - Easily erase raster images, lines, arcs, and circles using standard AutoCAD commands on raster regions and primitives with raster entity manipulation (REM). - Create lines and polylines from raster images with vectorisation tools. - Incorporate geospatial raster data with image transformation functionality. 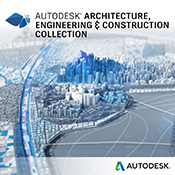 Display and analyse geo-referenced images when the software is used with AutoCAD Civil 3D and AutoCAD Map 3D software. With the release of the 2019 version, AutoCAD subscription will include access to all AutoCAD vertical product functionality/libraries as specialised toolsets. Customers will now have access to the capabilities of multiple AutoCAD vertical toolsets in one AutoCAD.